And while he was mixing [that] mud…. it's in the quarter that he's chopping wood! The plural suffix -rą is not found in liturgical Tsi, where the two animate forms are class 6 -rǫ and class 5 -ąą. Possibly it is a dialectal form, a combined form, or a modified version of the former to avoid ambiguity with the demonstratives. Note that whilst forms of the (historical) classifiers (o)q!ʰạ (used for large features of the landscape),(o)hạ (used for tools) and (o)hąą (used for animals) do appear frequently in spoken Tsi, they have been in a sense 'degrammaticalised' and are used as part of the honorific system rather than as classifiers or anything else. They can and do co-occur with true classifiers, which was impossible in older forms of Tsi. More important than the limited system of agreement, however, is the complex series of auxiliaries that Tsi uses alongside main verbs to distinguish between verbs with animate and inanimate objects and subjects. The system is effectively split-ergative, with imperfective verbs accompanied by auxiliaries determined by the animacy of the subject and perfective verbs accompanied by auxiliaries determined by the animacy of the object. Tsą/cçę (reduced versions of ‘to walk’) are used for verbs with animate subjects and imperfective meaning. Bà(‘to take’) is used for verbs with inanimate objects and perfective meaning. (8) Ya-dgo kto bà mte quuŋ-odʰę… . Hųų - directional ‘to, up to, into, towards’. Ro - affective (benefactive/malefactive) or genitive. (8) mad g|í Tsààd ro mà ŋ|oŋ|o àà! There's a great noise out in front of the gates of Tsat! However, these prefixes cannot be freely applied to any verb and with many verbs (šo-dòg 'spit', ya-dgo 'mix' etc) the combination of root and prefix is lexicalised. Some roots only appear with prefixes: aqa-qǃʰo 'scatter' for example. (he) lifted (him) up/lift (him) up! The main verb may be a 'compound' verb with a nominal element. In inscription Tsi these are predominantly formed with the largely semantically empty light verb χad. Both 4b and 4c show the common tendency in spoken Tsi to reanalyse -ç/x as a contraction of the nominaliser içç and drop the nominaliser (although etymologically they are totally separate). Other speakers however accept mad here. Inscription Tsi uses the postposed qǃʰạ, as seen in (4). (10) pʰò qa-mdòt k!a hąą bà jòò? NEG apart=wood chop HNR take why? Although this use of classifiers was ungrammatical in the form of Tsi cultivated into Inscription Tsi, the semantic gap left by their absence - and the discomfort this inevitably caused Tsi scribes and bureaucrats - has meant that this usage has found its way into written language as well. The 'serial verb' slot is the freest and the vaguest. The name 'serial verb' is probably more of a diachronic one than a synchronically appropriate one: most serial verb constructions in Tsi as in related languages are grammaticalised to a greater or lesser degree. There are two major kinds of serial construction, locative (applicative) and adverbial. (12) ŋǃee ɢǂʰuɢǂʰu tsà Tsààd-tʰo ay! go sweat ANIM Tsat-PROX MOD! He's going (all that way) to Tsat! (14) g!u k!ạ mde bàq-bàq ay?! string_up pat one terror_bird MOD!? You caught a terror bird, just like that? Tsi has two causative prefixes, one 'distal' ((a)xo-) and one 'direct' ((a)mpa-). Unlike English Tsi does not distinguish between 'make' and 'let', at least not with its core causative morphology. Rather, the semantic distinction is to do with the extent of participation in the action by the causer. The 'direct' causative expresses a closer participation and is the default. Often the former can be translated with 'have X do something', although the most appropriate translation is very context-dependent. 15a might be said for example of an officer present at the scene, whilst 15b might perhaps be said of an order received from afar. Not only physical distance but also metaphorical distance plays a role, and the distal causative is often used to preserve the dignity of the ritually pure, sometimes to the extent of being added where a strictly causative reading is not necessarily accurate. (16) might be used even where the prince threw the objects out himself. The syntax of causatives is relatively straightforward. The object remains the same, but the original subject is demoted to an indirect object followed by the postposition hųų. This additional object can easily be dropped. There are three main types of conditional in Tsi. (4) ya-q|ʰą dòχ bà pʰò ya-ddòχ bà-x, srii mzạ-mzạ bèd nyè bà ŋǃoo? away-skin steal INAN NEG away-steal INAN-SUB, strong barter-AUG sell bring INAN, right? If he had stolen the (terror-bird) skin, he would have sold it for a lot of money, no? (5) ya-q|ʰą bèd bà zu yè? away-skin sell INAN then what? Say I did sell it - what then? If I sold it, what would happen then? (6) qa-'t ŋǃè ɢǃònù ro zu yè? And what about if I split your head open? And while he was mixing mud…. This is synonymous with the (perhaps more formal) structure. The most prominent TAM element in Tsi by far is aspect. Verbs can either be perfective, which in a broad sense means they describe one specific narrowly defined action, or they can be imperfective, which means they describe an action perceived as drawn out or approached as somehow segmentable. The imperfective-perfective distinction appears throughout the verbal system. Imperfective verbs necessarily appear with an auxiliary (the choice of auxiliary depends on the animacy of the subject). Perfective verbs take a different auxiliary if the object is inanimate and no auxiliary at all if the object is animate. The aspect of the verb also determines the reading/permissibility of various constructions, most prominently the converb construction hu. That is, in the meaning of 'get dressed', qdo cannot appear with the expression literally meaning 'while', (içç) aŋŋo. Verbs with certain directional prefixes are often (though not exclusively) also restricted aspectually. This is particularly true for (a)ya- 'backwards and forwards', which is probably the most freely productive of the prefixes and often derives iteratives from perfective verbs. (11) Ya-dgo kto bà mte quuŋ-odʰę… . Confusingly, verbs with hu appear without auxiliaries, meaning that free-aspect verbs have identical form in both meanings. Context and the main verb typically serve to disambiguate. Tsi has no morphological or any real 'grammatical' mechanism for marking tense. Time adverbs are typically used to set the general tense of a narrative or a sentence. Tsi exists in a state of relatively differentiated diglossia, although the differences between the scriptual-bureaucratic inscription Tsi and spoken Tsi are not so gapingly distant as to be mutually incomprehensible. Perhaps it is better to think of inscription Tsi as an unusually differentiated, archaising register of Tsi. It is important to note that the 'ideal' of inscription Tsi (which reflects to a greater or lesser extent the cherry-picked spoken Tsi of centuries past) is typically diluted to a greater or lesser extent by influence from spoken Tsi. Inscription Tsi makes use of some archaic or unusual vocabulary which is no longer in use in speech. It also makes use of a number of archaic constructions, some of which we have seen in the grammar presented so far. Most characteristically, it maintains the use of a differentiated classifier system (collapsed in spoken Tsi). It does not typically make use of the auxiliaries, and retains more of the morphological machinery used to distinguish perfectives and imperfectives (many perfectives have a final -d, which occurs much more rarely in normal spoken Tsi). In its spoken form it lacks many of the contractions found in normal speech and has some elongated versions of morphemes. A form of spoken inscription Tsi is used in prayers and magical invocations, in formal addresses to government (which in a sense are the same thing), in legal proclamations and so on. It is in this use (the deliberate preservation of archaising and indirect language) that Inscription Tsi began, and it has a much longer tradition as a spoken register than in writing. However, since the Kangshi script was imported into the Tsi-speaking area, inscription Tsi has also been used in writing and of course on imperial inscriptions. These inscriptions are one of the most visible signs of imperial power throughout the archipelago - even if very few of its residents can read them. Whilst very few people have any kind of active command of inscription Tsi and a whole small industry flourishes around those who do (magicians and folk healers, priests, scribes, official petitioners etc), there are many native speakers of Tsi - certainly more than any other language in the archipelago. 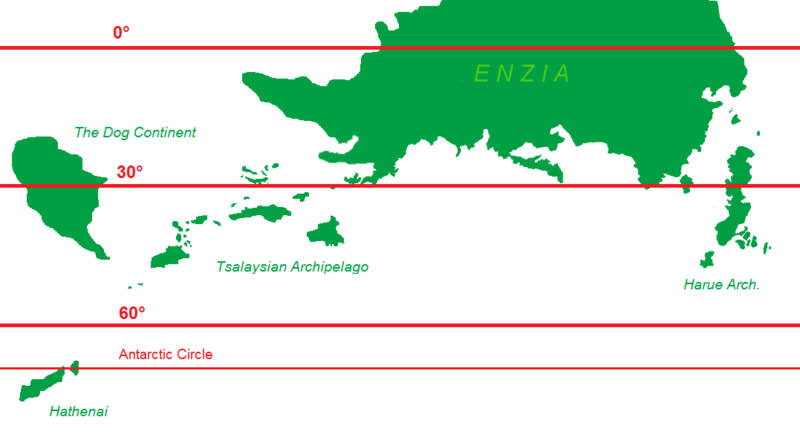 The majority of these speakers are inhabitants of the largest of the southern islands of the archipelago, Haŋŋo-Dze. The coastline of these islands is dominated by the Tsi decapolis, which taken as a whole have historically dominated trade both within the archipelago and (more importantly) from the archipelago out to the rest of the world. The cities are all to some extent differentiated from one another dialectally, particularly the oldest cities. The inhabitants of the smaller rural settlements are famous for their distinctive and bizarre ways of speaking, which are a constant source of jokes for the urban classes. With the expansion of the empire, Tsi-speaking colonies have also sprung up in far-flung places, all of which are gradually developing their own ways of speaking - particularly with the adoption of Tsi by local elites. The borrowed one, taken over from Cuhbi, is synchronically decimal. The distribution of the two systems is largely determined by the origin of a word: native words take native numerals, borrowed ones take borrowed numerals. There are, however complications. The first is that Cuhbi numerals were borrowed along with the classifiers they cliticize to in Cuhbi. The second is that some native Ubghuu words whose counted is associated strongly with foreign culture take Cuhbi numerals as well. Thus, "five Cuh men" would be bòqh tsoʔ, since bòqh is a native word. "Five Tsi men" would be phay yą̀dìŋ, since phay is a borrowing from Tsi. "Five days", finally, is equally thɔl yidìŋ, since the exact keeping of time is largely an imported custom, even though thɔl is a native word. For numbers over ten, different rules apply depending on the speaker. Since neither Cuhbi nor Ubghuu have (surviving) native numerals over ten, the Tsi words for multiples of ten are used. Depending on the speaker's fluency in (pidgin) Tsi and their social status, numbers higher than ten may be borrowed wholesale or formed as a combination of the Tsi decimal plus native numbers. In either case, however, native and non-native words are treated the same, and classifiers are not used. Thus, "seventy-three days" might be either thɔl ŋìŋgalii (the fully Tsi form) or thɔl ŋìŋgavaŋ. Ubghuu kinship is organizationally complex, but terminologically simple. Like many island-bound agricultural societies of Earth, the Ubghuu follow a multi-tiered system of ambilinear descent. That is to say, both the matrilineal and patrilineal lines of descent are recognized. The largest unit of kinship recognized in Ubghuu society is the mbìì, a loose type of clan consisting of the descendants in both lines of an ancestral couple. A given individual may belong to several mbìì, in excess of ten in some cases, depending on the degree of endogamy in their immediate ancestors. Upon reaching marriageable age, an individual is inducted into a wǫ́ǫ́, which is a matri- or patrilineal group within one of the mbìì they are a part of. Which wǫ́ǫ́ to join is largely up to the youth. While the social function of the mbìì is mostly regulating the inheritance of arable land, the wǫ́ǫ́ is much more important, providing social support in conflicts as well as helping to organize marriages (which always involves another wǫ́ǫ́, as they are strictly exogamous). Children are initially considered to be a member of the same wǫ́ǫ́ as their parents. Once they are inducted, the terms of reference may change depending on which one they joined. To honor the saving of this thread, a translation of the Babel story into Ubghuu. Yng-style explanations coming soon (really). Giip ma uyóó hɛ̀ɛ̀dzɔ̀r ʔigigíímuu. Eyáá sthɔɔwhi umrókthų́ye, ʐinar lwììhìdhèŋ kuuʔwáh uthįįkbyèyìgì mààŋ ʔithɔvɔ́tshííwi. "Thɔrmààŋ áábe ʔdziguuyid oʐuzáámkháríídhiyɔq" thovòmtsidzííwi. Mààdzɔ̀r phę́ę́vo áábe ʔgigɛktɛdhùʐìì tlɔ̀zbò qudzvaŋ ugɛktɛdhùʐììwì. "Thɔrmààŋ mbɔ́raa khuhų́ų́laa wazààrɛ̀ɛ̀ʔqɛ́mthɔ́rtsíyiŋ oʐɔɔmpoŋnaazaŋtsíyiŋ thǫ̀ǫ̀ bɔɔghɛ̀ɛ̀ndzàŋfarʔeŋ giibeŋ qą́ą́ uyóóyɔ́ʁuu." give-here city-COM tower-COM TRI.EGO-build.IRR-up-BEN-REFL-PFV=1pINCL and=CONJ.INV-name.IRR-CAUS-REFL-PFV=1pINCL that_not CMPL-CONJ.INV-be_apart.IRR-CAUS-AND=NEG=1pINCL earth-LOC EMPH CONJ-be_whole=QUOT=it_is_known. Ŋáád na ʔiphíyi bo dzɛ́p uzààrɛ̀ʁɛm mbɔ́raa khuhų́ų́laa buváduu. Ŋáád na "eyáá dzɛ̀p ma uhɛ̀ɛ̀hą̀ą̀, ŋkíímid na uhɛ̀ɛ̀hą̀ą̀, mààdzɔ̀r krɔph ʔgiyáátshiiʂ. ʔúúw hɔ̀ɔ̀ krɔph bákh uváátsuhį̀į̀gì wɔɔyáhmyęęʔe qą́ą́ khaayɔq" ʔivòmììwì. "Thɔrmààŋ yaphyúú ŋkíímid na oʐundùʂʂùŋùd thǫ̀ǫ̀ ugigíímiye bɔɔyą̀ą̀wʔultsídzíʔeyɔʁuu". give-here ITR.EGO-descend.IRR language=3 TOP then=CONJ-swap.IRR-head=3 that_not CONJ-speak.REAL-SIM CMPL-CONJ.INV-hear.IRR-take-RECIP-NEG=QUOT=it_is_known. Ŋkíímid wɔɔdhùʂʂùŋgì ŋáád na ʔgighɛ̀ɛ̀ndzàŋad giibeŋ qą́ą́ uyóó; mbɔ́r na ʔgizààrɛ̀qhɔzuu. Ŋáád na mɛ̀ɛ̀ŋ ɴɢɔ́r ŋkíímid uhátshɛ́záhį́į́hąą dzɛ́p ughɛ̀ɛ̀ndzàhį̀į̀hą̀ą̀ giibeŋ qą́ą́ uyóó krɔphɔd mààhi mbɔ́r pnaad na Babel yɔq. lord TOP there people language=3 CONJ-separate.REAL-CAUS-PFV-NMLZ-COM mankind CONJ-be_scattered-CAUS-PFV-NMLZ-COM earth-LOC EMPH CONJ-be_whole thing=3 this-ABL city name=3 TOP Babel=QUOT. Oh boy this thread has existed for almost two years and we haven't made much progress on the geography front. Time for some MS Paint! I have taken the liberty of taking an ancient map Nort slapped together once and adding some stuff. I have no idea what this involves but assume whichever projection least distorts the relative size of the land masses in this cutout. Next up, approximate distributions of language families. Looks like you've got a remarkably vertical terrain in some places. Tsi has three 'honorifics' originally derived from classifiers, as mentioned previously. These honorifics are syntactically versatile: they can attach to nouns and pronouns, stand alone as anaphora, and appear within the verbal complex. In addition, the absence of any classifier (which we'll call 'unmarked') expresses (rarely) equality or lower social standing. The etymology of (o)q!ʰạ (originally a classifier for large geographical features and by extension their personified forms as deities) and (o)hąą (originally a classifier for animals) is fairly straightforward. (o)hạ, which derives from a classifier used originally for round objects and tools, is perhaps less transparent. Its usage is rooted in the Tsi equivalence of the concept of 'imperial slave' and 'citizen' (ngkòd) - that is, the elevated social class carrying the greatest amount of prestige are conceptualised simultaneously as property of the God-Emperor. The 'tool' classifier was extended metaphorically to refer to these individuals - a use attested in the oldest Tsi - before being (de?-)grammaticalised and extended by association to all social superiors. Note that incorporated nouns cannot take honorifics. Where social superiors are being addressed, these forms are often used considerably more than is normal for pronouns in other contexts. (2) ktọb-ohạ-rų šo-k|ʰòò-hạ bà qǂeχ-ohạ ho? water=HON=DEM down=pour-HON IN.PRF please-HON INT? Should I pour sir some of this water [if I poured this water, would it please you?]? (3) pʰò qa-mdòt k!a hąą bà jòò? Tsi honorifics mark the social relationship between the speaker and the addressee (second person) and the referent (third person) of their conversation. Their usage varies to some extent dialectally, and misuse or underuse of honorifics is a stereotypical feature of rural speech. But for urban speakers in the central areas of the Tsi Empire at least they are fairly standardised. It is fairly unusual for two Tsi to occupy an identical position on the social ladder. Family, profession, gender (male > female) and age (older > younger) are all determinants of relative status. Within most social interactions, the difference is understood but not seriously marked: use of the unmarked (zero-honorific) forms and the respectful ((o)hạ) forms does not necessarily express a significant gulf, and in fact in most Tsi interactions is accompanied by use of familial forms of address expressing a kind of respectful affection. Both sentences express the same content, but reflect different relative positions between Dzo and the speaker. In a) Dzo has a higher social standing than the speaker, in b) a lower social standing. The social difference need not be that significant: in 4a the speaker could be his older sister and in 4b his older brother, for example. 4b could also be a long-term friend of the same gender and similar age - one of the few contexts in which it is possible to express near equality in status. In a relationship of this kind, both speakers using the unmarked form to address one another is normal. However, even in this kind of relationship, outside familiar situations a more conventional age differentiation or mutual use of the respectful form is likely to take the place of the unmarked form in the third person (i.e. when discussing the other party with someone else). The ultra-elevated form, meanwhile, is used when referring to the imperial person, the royal family, and high-ranking levels of the bureaucracy as well as deities (the exact rank after which (o)q!ʰạ has to be used is not entirely clear, and depends to some extent on the status of the speaker as well). However, when more than one constituent of the verb has social status (i.e. is animate), the constituent with the highest social status takes priority, forcing the verb into that honorific form. (11) ktọb-ohạ-rų šo-k|ʰòò-hạ bà qǂeχ-ohạ ho? In this case the subject of šo-k|ʰòò 'pour' is clearly the speaker, but more importantly, the addressee is not an explicitly stated constituent or direct object. Nonetheless, as an implied beneficiary, the addressee still demands an honorific form. 1) Is it ever grammatical to use mixed markers? e.g. can the subject of a sentence have the lowest rank but the verb he's the agent of have a higher rank? 2) Are verbs in this language marked for person? I didnt see any person marking in the various sentences, but the English translations used "I" and "you". Is this inferred from context using the honorifics? Here 'bite' carries respectful marking (referring to the object, the highest-ranking constituent) and 'dog' derogatory marking. 2) No, Tsi has very little productive verbal morphology (affixation proper is basically limited to one subordinating suffix and one largely fossilised aspect suffix). The person is determined by the context - honorifics are one disambiguation tool, but given that the honorific can refer to object, subject or any other kind of constituent the situations in which it can disambiguate the subject decisively will be comparatively rare. The translations given are usually one of a number of possible translations depending on the context given, and reflect the point I'm trying to demonstrate in that section - 8b pʰò ktọb su bà could be first, second or third person singular or plural depending on context, with the absence of an honorific reflecting only that the subject is either the speaker (assuming they aren't someone who would be expected to use a different form in the given context) or someone with lower social standing than them. (1) rlàŋŋạ to-srob là lʰo bà fon? Where did the soldiers set up camp? (2) pʰò qa-mdòt k!a hąą bà jòò? Why didn't you chop the wood?! Where did he (that higher-ranking gentleman) come from? What did you see then? (6) rlàŋŋạ-tʰų kǂay-kǂay tsa ne-lʰo-d? What is it that those soldiers are dancing around? (7) ktọb-ohạ-rų šo-k|ʰòò-hạ bà qǂeχ-ohạ ho? water=HON=DEM down=pour=HON IN.PRF please=HON INT? (8) dzè qa-mdòt k!a-hąą bà ho? NEG.INT apart=wood chop=HNR IN.PRF ho? Didn't you chop the wood?! (9) omu qa-mdòt k!a-hąą bà ho? INT.RHT apart=wood chop=HNR IN.PRF ho? You didn't chop the wood?! Not that atypical. Mountains don't actually tend to stand in the middle of slowly rising terrain, since orogenesis tends to be a rather abrupt process. By geological standards, at least. 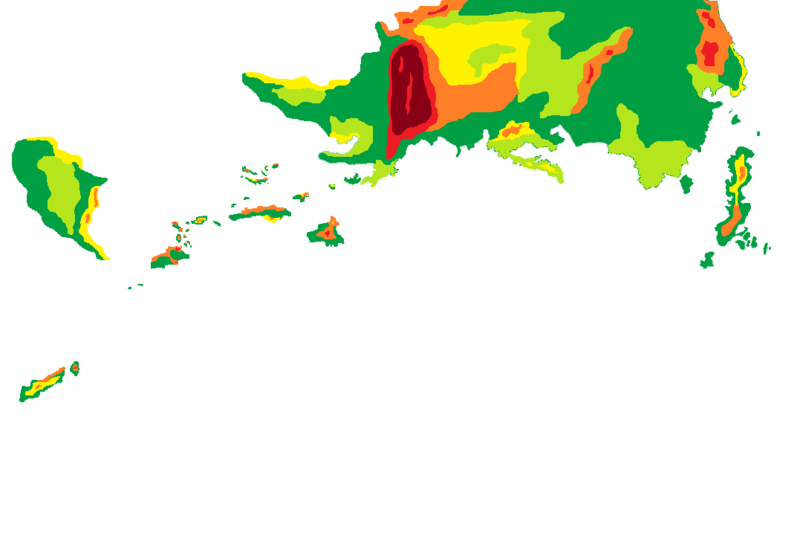 This is more or less a low-res redux of the Tibetan plateau, really. The Tsi personal pronouns are as follows. Each form has a tonic and an atonic form. The atonic pronouns are fairly uncommon. One reason for this is that Tsi is typically fairly pro-drop, especially but by no means only for subjects. The other reason is that their use is somewhat limited by the same system of politeness and respect grammatically encoded with honorifics. In fact, as mentioned above, honorifics often appear in an anaphoric usage standing in for personal pronouns. The tonic personal pronouns are typically only used for people with whom the plain style is acceptable - typically the speaker and those lower on the social spectrum. (1a) mdò bà-na ho haa? Did you see them then? (1b) mdò bà ninạ ho haa? see IN.PRF 3pl INT then? (1c) mdò bà tʰobʰų ho haa? see IN.PRF DEM.IN INT then? (3) yii ge q!ʰèèka zu? With more distant social relationships - not necessarily ones which trigger remote honorifics - ge may be considered impolite.